PRAGUE, September 22, 2006 (RFE/RL) -- The saiga antelope is an odd-looking thing, with bulging eyes and a bulbous, tubular nose to filter out dust and warm cold air before it reaches the animal's windpipe. The nomadic, herding saiga (saiga tatarica tatarica) is found primarily in Russia's Republic of Kalmykia, Kazakhstan, Uzbekistan, and Turkmenistan. But scientists say the creature is on the verge of extinction. Over the last decade, its numbers have declined from more than 1 million to around 30,000. Eleanor Milner-Gulland, a leading expert of the species, tells RFE/RL that the decline is mainly the result of hunting -- for meat and horns. MORE IMAGES: A photogallery of the saiga antelope in Kalmykia. "What happened with the break-up of the Soviet Union was that there was that kind of linkage of several different things that went wrong," Milner-Gulland says. "When the border [with China] was opened there was a ready market for these horns. At the same time there was a breakdown in funding for saiga management and conservation. And there was also a lot of poverty as people lost their livelihoods, their collective farms, and so on. 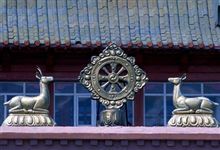 These three things came together to make it really very tempting for people to poach saigas for their horns for export to China and also to make it so that people needed to hunt for meat." Saiga horns fetch around $100 a kilogram in China, where it is used in traditional medicine. Milner-Gulland says selective hunting of the male saiga for its ringed horns has caused the hornless females to outnumber males, further endangering the species. "At one point, there was one male to 200 females recorded in Kalmykia in Russia," she says. "So there were reports in both Russia and Kazakhstan of females going un-mated and a big drop in the number of juveniles. It seems that the proportion of males has slightly improved in the last couple of years. So [males are] about 5 to 6 percent in most places, which is still not great." Saigas were placed on a list of critically endangered species by the World Conservation Union in 2002. Asylkhan Artyqbaev, a member of the Kazakh nonprofit Ecologists Society, tells RFE/RL that the region's inhabitants have begun to realize that the animal might disappear if nothing is done soon to stop poachers. "First of all, people began to understand the situation," Artyqbaev says. "Second, officials in Kazakhstan, Uzbekistan, and Russia began to realize that the saiga antelope is disappearing. The Seymar company, which is the leading poultry producer here, has allocated money to research the situation around the saiga antelope." 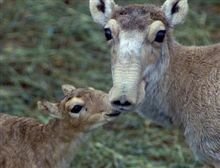 The government of Kazakhstan pledged more than a year ago to invest a significant amount of money into a three-year conservation program for rare and endangered species -- including the saiga. In Uzbekistan, the State Committee for Environmental Protection organized a roundtable in August with local researchers and environmentalists to discuss ways to ensure saiga survival in the country. Decisions were made to establish a joint Uzbek-Kazakh nature reserve on the Ustyurt plateau, to set up migration corridors, and to hire locals as game wardens. 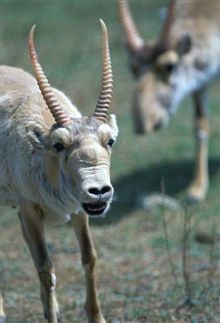 The horns of the male saiga are used in traditional Chinese medicine (shpilenok.com) In Uzbekistan, the State Committee for Environmental Protection organized a roundtable in August with local researchers and environmentalists to discuss ways to ensure saiga survival in the country. Decisions were made to establish a joint Uzbek-Kazakh nature reserve on the Ustyurt plateau, to set up migration corridors, and to hire locals as game wardens. A pilot project is being carried out around Kalmykia's Chernye Zemli wildlife reserve. The "rotating cow" scheme provides a cow to families in need who are chosen by the rest of the community. Female offspring born during an agreed period are returned to a central "cow bank" to be passed on to the next family. Participation is conditional on the village fulfilling its obligations not to tolerate poaching in its area. An important step came in November 2005, when a memorandum of understanding on saiga conservation was signed by saiga-range states. The document commits signatories to provide effective protection for the antelope. It also commits them to implement an action plan to restore saiga populations and enhance cooperation through a regional conservation strategy. Milner-Gulland says another major milestone will be reached on September 25-26, when representatives from all range states meet in the southeastern Kazakh city of Almaty. "[The meeting] is very important for the saigas, because it's the very first time that all range states -- governments -- and scientists have all got together to talk about saigas," Milner-Gulland says. "The [memorandum of understanding] has been signed so far by Uzbekistan and Turkmenistan. Kazakhstan has signaled they'd be signing at this meeting. So the [range country] we don't have is Russia. What will come out of this meeting is a prioritized plan for [the] work program to go forward. So we'll have an idea about what needs to be done in each place. And hopefully that will help when we try to get financing to do that." Milner-Gulland, who will attend the gathering, says she hopes participants agree to increase the number of mobile antipoaching units and involve residents more in conservation projects. Milner-Gulland also wants efforts to inform locals on the cultural and economic benefits of saigas. "They have this great cultural interest," she says. "They're a nomadic species [and] they are a symbol of the steppes. There's that kind of link between people's heritage and this piece of wildlife. And then on the...more practical side, the saiga was until 10 years ago a really valuable and productive part of the ecosystem. It produced meat, horn, [and] skins. If the population was large enough, that could start again. There could also be potential for tourism [and] trophy hunting. So the saiga could pay its way if it were allowed to recover as a component of a sustainable steppe that could go on to the future." 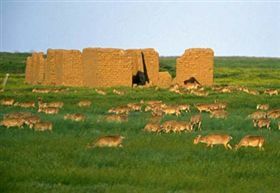 The saiga are revered in Kalmykia (shpilenok.com) "They have this great cultural interest," she says. "They're a nomadic species [and] they are a symbol of the steppes. There's that kind of link between people's heritage and this piece of wildlife. And then on the...more practical side, the saiga was until 10 years ago a really valuable and productive part of the ecosystem. It produced meat, horn, [and] skins. If the population was large enough, that could start again. There could also be potential for tourism [and] trophy hunting. So the saiga could pay its way if it were allowed to recover as a component of a sustainable steppe that could go on to the future." In an effort to improve knowledge about saigas, a new visitors center was formally opened in May at the Center for Wild Animals' saiga-breeding center in Kalmykia. The new center is equipped with displays on the saiga's ecology and conservation alongside an exhibition on Kalmykian culture. The breeding center also has facilities for researchers to stay on-site, and a classroom for school visits.